Catholicism for Everyone: THIS during Communion needs to STOP immediately! There's something I've seen from time to time during Mass that I find very disturbing and unfortunate. In my opinion it must end immediately. What I am referring to is people chewing gum while receiving communion. It's already bad enough to be chewing gum during mass at any point even before communion and then throwing it out before going up. Even that is not acceptable. 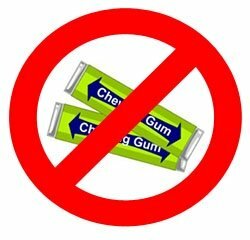 But I have actually seen people who are in the communion line who are chewing a big wad of Gum as they go up to receive communion. There are many things wrong with this. Number 1 it means you are mixing the body and blood of Jesus Christ Our Lord and Savior with your chewing gum. This shows an absolute disrespect towards the body and blood of Christ and perhaps demonstrates that the person does not truly believe in what they are receiving. In fact Catholics are asked to refrain from eating of any kind for at least 1 hour before receiving communion. This is based on the same reasoning as mentioned above. It is to show a certain reverence towards the most holy thing on this planet. It is also worth noting that there is a certain proper way to receive communion. Communion is meant to be received with great reverence and respect. People should not be doing the Eucharist like they would be doing any other random food. The Eucharist itself which is made of Wheat and then during transubstantiation becomes the body and blood of Christ is very thin and melts in your mouth after a very little time. It's not like you are doing something that is very tough and needs to be chewed a lot. I think overt chewing shows again a certain lack of respect or understanding as to what you are receiving. It is also worth pointing out that receiving communion in the hand first and then picking it up and placing it in your mouth was and still is considered an exception to the general rule of receiving communion on the tongue. I will admit that by and large I receive communion in my hand and then place it in my mouth myself. Most of the reason for this is that it is not configured in such a way to make it easy to receive on the tongue. I'm a fairly tall person and most of the time if I try to subtly show them that I want to receive communion on my tongue they act bewildered and many times they try to force me to take it in my hand because they have no idea what's happening. I would estimate that only about 5% or fewer people actually receive communion on the tongue. And I greatly respect these people. On the other hand during Latin Mass they make receiving communion on the tongue easier. To conclude, we must demand the utmost reverence for people when receiving the body and blood of Jesus Christ in the form of the Eucharist which is the most holy thing on the planet.